Several health mishaps and travel delayed my posting, but what matters is we are here now. Living in the moment. I’m not sure when the next post will be, since I am still ill and need to lay off the drinking. Fortunately this blog is not my livelihood (yet?!). But I still wanted to be darin and I realized that I had not done any gummy candies. Only one word came to mind: Haribo. The candy I associated with my brother’s trips to Germany and my stays at French & German camp. But now you can buy them everywhere. The Dream: I’ll be honest, I worried about the gummy bears a little bit. They are so, so very sweet and it is hard to eat them with any beverage. I felt more optimistic about the Happy Cola. It is a strange candy, but has flavors that don’t invade your mouth. And though I love gummy bears, they are practically a war weapon with the way they make you feel post consumption. The wine…I had no thoughts since Italian wine is like most things on this blog: I know very little. But the description said it would have soft tannins. The Reality: The wine is very bitter and has a tart, cherry flavor. It reminds me a lot of bark in some ways. I can see why it is a recession buster, because it punches you in the mouth a bit. The only candy to stand up to this wine was the Happy Cola. Happy Cola isn’t overwhelming in its sweetness. It is almost like a Diet Coke, lacking that rush of sugar that grazing past your teeth when drinking regular Coke. The Gold Bears are another story. It just wouldn’t work. The wine felt unpleasantly sweeter when paired with the Bears. 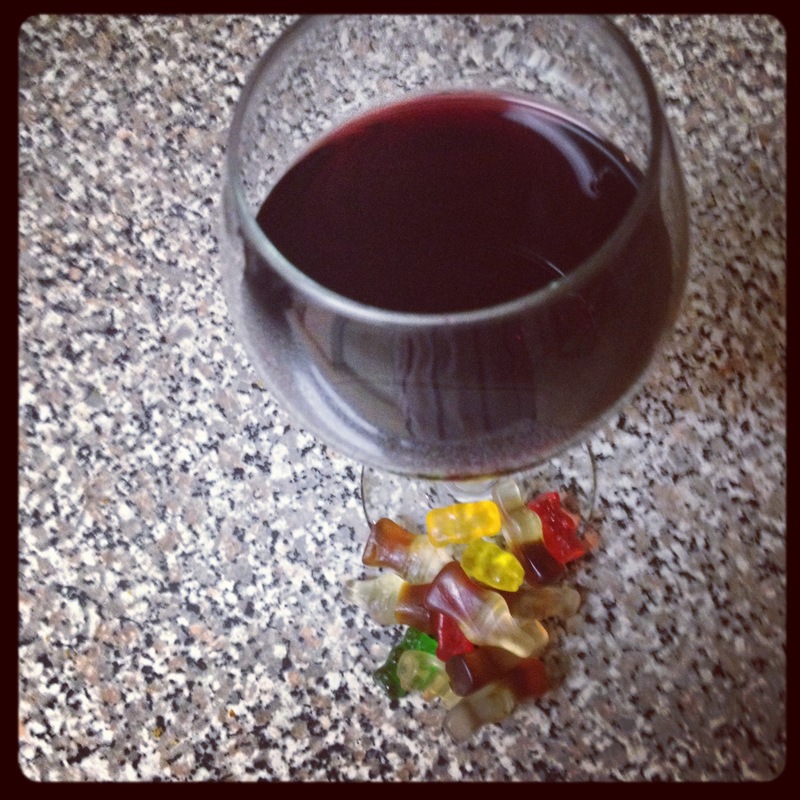 And when paired with the wine, the bears lost each individual flavor. They just blended into one underwhelming mass that I knew would make me sick. You’ll have the worst stomach ache. 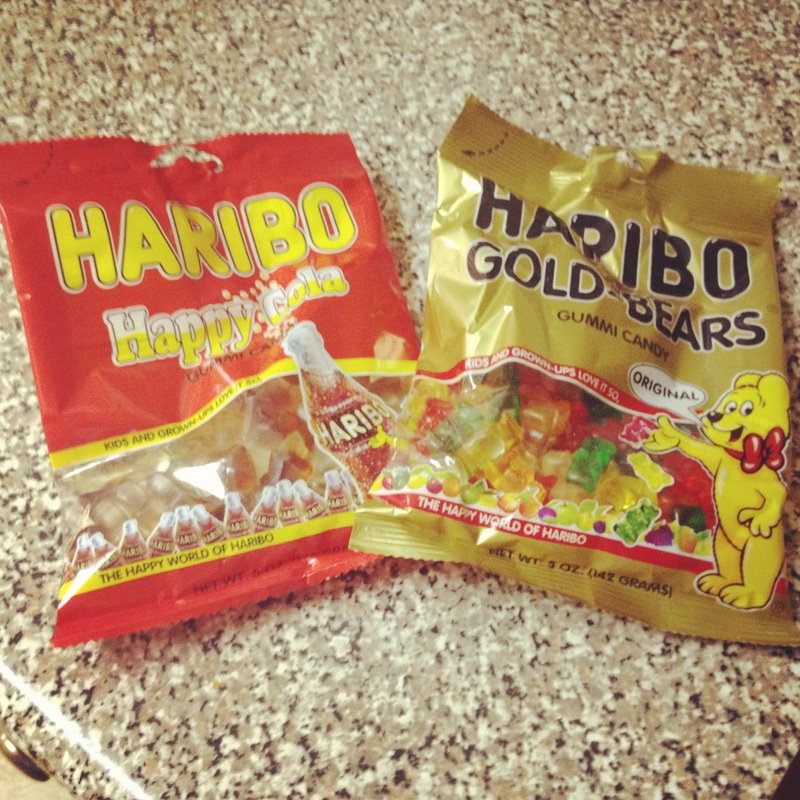 Posted in Uncategorized and tagged Candy, Gold Bears, Gummy Bears, Happy Cola, Haribo, Italian Wine, Red Wine. Bookmark the permalink. Friends, I have been challenged. And I am afraid I have not met up to the expectations. But every time I “lose” a challenge, I plan to revisit it until I can satisfy both my ego and my readers. Seems simple, doesn’t it? I already had an Argentine red wine in mind, all I needed was a tasty candy. I knew I wanted something unusual and definitely something I had not yet tried. I also wanted to buy something you could get at a regular grocery store. I will branch out in the future to stranger tides, but I want this blog to be accessible. If you can’t find the candy, what is the point? How can I advise you? I found quite an unusual candy and thought it could make a dashing suitor for my Argentine wine. I did not know anything about this wine except that it was red (what else is there to know, right?) And I don’t allow myself to cheat, because that is not how you learn. Looking at the wine, I didn’t think it was sweet. How could a funky llama be sweet, after all? I figured it would have a strong flavor, because that llama looks like he means business. So these cute little ‘shrooms seemed just the thing. They looked crisp, with just the right amount of milk chocolate. And they had personality. I wasn’t confident, since I did not know much about “tempranillo”, but I felt comfortable with my pick. It wasn’t….bad exactly. But also not great. Tempranillo, according to Wiki, “is a variety of black grape widely grown to make full bodied red wines.” It is known to have flavors of vanilla, tobacco, berries, plum, and herbs. Our llama has a citrusy, almost lemony flavor. It is strong and extremely flavorful. At the same time, I tasted a high amount of tannins. It ended on a bitter note, while remaining lovely. But the Chocorooms sort of wilted underneath the strong flavor of the wine. The flavor was too subdued. Although tasty, they would probably go better with a Sauvignon Blanc than a Tempranillo. They pairing was not unpleansant-they went together fine. But I would suggest something bolder. In terms of international candies, I am not exactly sure what this would mean. I wouldn’t recommend anything with a crispy cookie part. It just didn’t work. I might suggest a gummy candy, like Haribo Berries. These Haribo, if I recall correctly, are strong. But their subtle sweetness would go well with this wine. One reoccurring question this blog keeps bringing up: do opposites attract? Or not? It is certainly a factor to consider in the future. Stay tuned for the Valentine’s Day special. 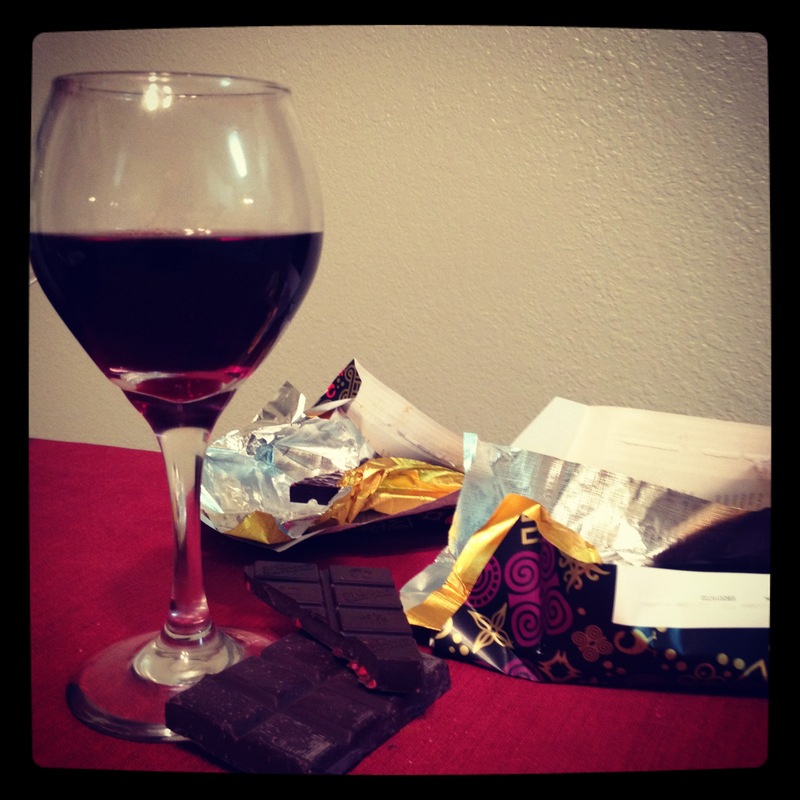 In that blog post, I’ll be singing sweet nothings to the planet Earth by pairing an organic wine and candy. Posted in Challenge and tagged Candy, Chocorooms, funky llama, Meiji, tempranillo, Wine, wine pairing, wine review. Bookmark the permalink. It’s time for an origins story. I came upon the idea for this blog when I was, surprise, drunk. But strangely enough, I was not hungover at all the next day. That could be for many reasons, but all I know is that a bottle of Malbec, salty licorice, and “Battlestar Gallatica” were involved. My boyfriend and I were obsessed with “Battlestar Gallatica” this summer. If you are unfamiliar with the show, all you need to do is watch this video from “Portlandia” to understand what it does to people. There we were, obsessing over this show all alone, when we found out Sam’s friend liked it. We spent several evenings with him attempting to finish the show. Since I was also fond of Malbec, I bought a bottle for all of us but I ended up drinking most of it. I also had a little bag of salty licorice. It was the perfect mixture. The fruity, spicy flavor of the Malbec combined with the pungent licorice flavor and salt searing my tongue was the type of winning combination I long to achieve again. I could not stop because I was so amazed that I had found this surprise. I could make a lot of “Battlestar Gallatica” metaphors, but I wouldn’t dare ruin it for you. My latest challenge was not to recreate that pairing. That would be lazy. Rather, I changed the players slightly to moderate success. Lets meet our team. Candy: Licorice Cats, my Mom bought these somewhere and I asked her for them. In my heart, I really did hope this was going to be like that magical night watching “Battlestar.” But I did genuinely think this is a good combination. As part of my general exploration of new wines, I chose to do a Cab because…well..it’s the new Malbec. I’m a wine tween ok? I get obsessed easily. I knew the cats were not salty, which I thought would work better with a Cab. Salty licorice is very in-your-face and Malbec can pack a punch as well. I knew these kitties would be serious licorice which was necessary for this pair (not that I don’t love a tasty bag of Licorice Bears from CVS). I had the right idea, but my error occurred several months ago when I pilfered these from my mother. These cats were truly feral while they were still packaged. They rode in the car, lived on the fridge, and by my desk. They stood by me in my darkest hours, letting me know that things could never get too bad since licorice was always at hand. As you can imagine, they got a bit firm on the outside. It was almost like they were hard candies. But the steel outside worked out well. The wine was very tart but had an excellent, smooth finish. I was worried these cats were going to disappoint me at first, because they tasted a bit sweet. But after working on them for awhile, the licorice flavor really kicked in and my saliva seemed thick with licorice flavor. The tart flavor of the wine brought a refreshing relief without compromising its own flavor or that of the licorice. Try a Cab that is tart along with the best licorice you can find. Don’t let it go stale, but also don’t buy something really gooey. Working to get at the licorice flavor enhanced the experience. Don’t like licorice? It’s not for everyone, but give it a try anyway. Good licorice can be pricey, but the Cab doesn’t have to be. So go ahead, get the first season of “Battlestar” and lose yourself. NEXT TIME: Candy without Borders: An international candy of my choice will meet its foreign pair. Stay tipsy, leave a comment, and make a request. Posted in Cabernet Sauvignon and tagged Cabernet Sauvignon, Groupon, licorice, Licorice Bears, orfila. Bookmark the permalink. Some would argue that wine pairing is an art. From a hefty steak to a gourmet Asian dinner, there is a wine for the occasion. A wino, a very sophisticated wino mind, would be the only one fit for the task. Well, I’m not that person. I stumble through wines. I pair my dinner with whatever wine bottle is the coolest or my latest obsession. I will drink only Malbec for months, bringing it to parties so I don’t have to explore other options. I’ll walk lazily through a store until I can find a Cupcake that suits my needs. It is time for me to learn through the best means possible: by eating candy. This blog will not be snobby. It will most definitely not be classy. It will not be a restaurant review from the New Yorker. I will sample the cheapest wines with the worst store-brand jellybeans. Sometimes I will try to pair candy with wine, or wine with candy. Most of the time I will probably fail. But when I succeed, it will be…not to be cheap..pretty sweet. My choice behind the pairing was so simple, it was too good to be true (hint: it didn’t work). To me, white wine is either dry or sweet. Since I go into these pairings without any research, I based the choice on my preconceived notion that Chardonnay is a sweet wine. Balancing the sweet was the challenge at hand. Chocolate seemed obvious, because the other bitter candies were either salty or not bitter enough. 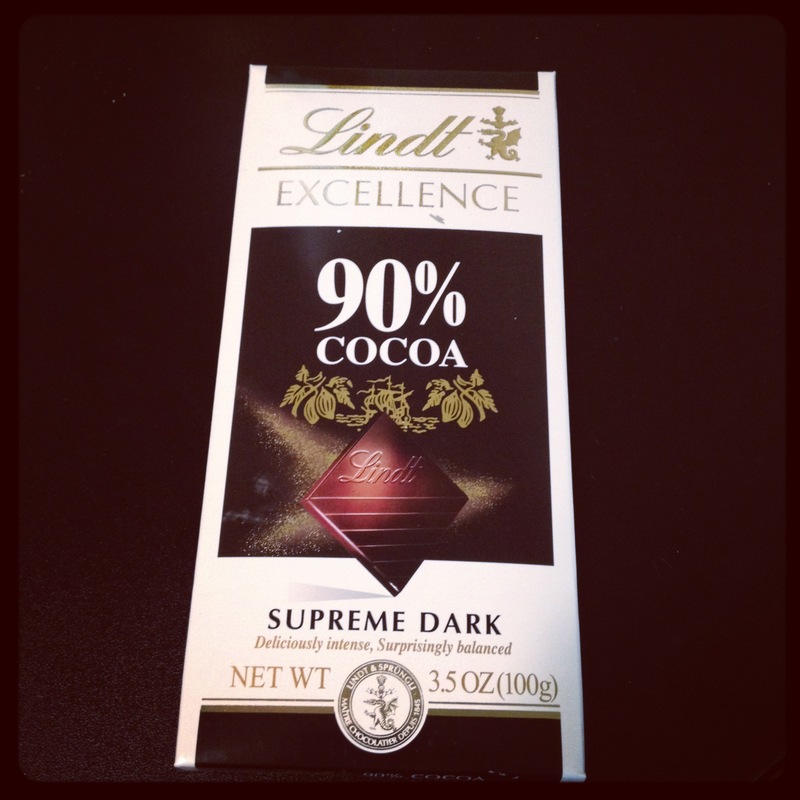 I chose the darkest chocolate available at my neighborhood Giant: Lindt chocolate 90% cocoa. Although the two make a pretty picture, they don’t necessarily compliment each other. The wine had a soft flavor instead of an overwhelming sea of sweet. It tasted subtle and smooth. It turned out, this chardonnay needed a partner that could compliment its softer side. The chocolate was far too dark-the expected sweetness of the chardonnay was supposed to balance the dark, intense flavor of the chocolate. Instead the thick and almost chalky Lindt stuck to your mouth as the Chardonnay could barely battle such strong flavors. It was still a tasty treat, but not the pairing I had hoped. 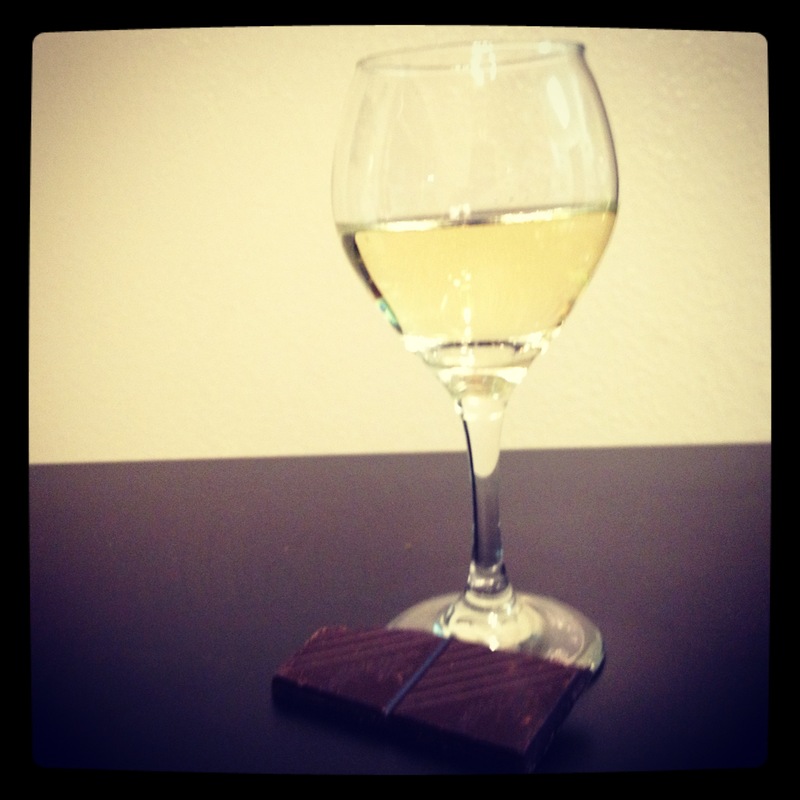 Takeaway: Chocolate is the type of candy to pair with a chardonnay. The challenge is to find the right type of chocolate. Is milk chocolate too sweet? Or is there an ideal middle ground? Or is chocolate not the way to go? I’ll keep this blog as updated as possible. I am welcome to challenges. Do you want to know what wine goes well with a Mallow Cup? 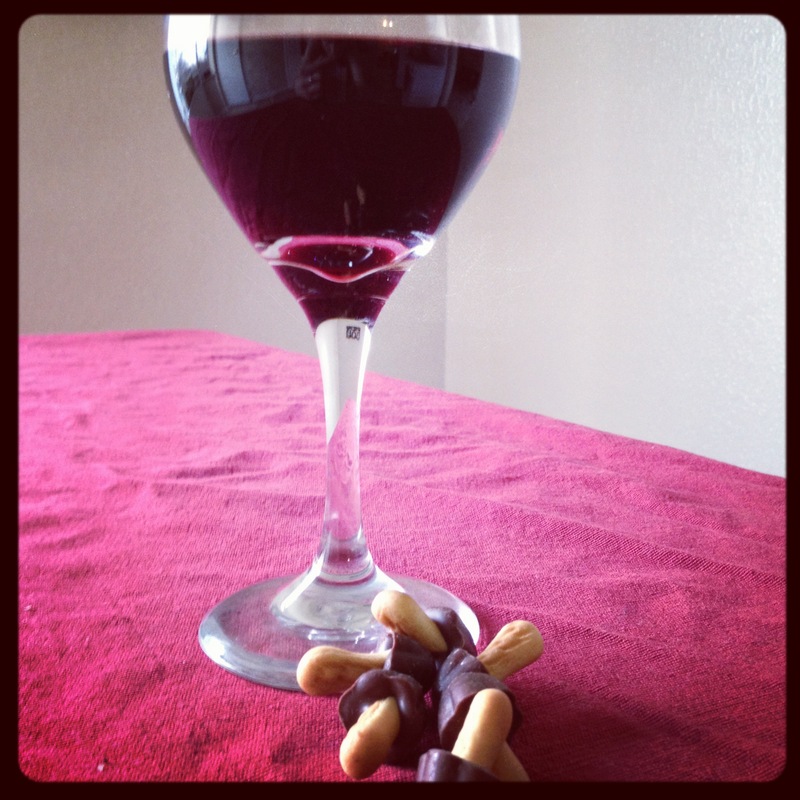 Do you enjoy a good Pinot Noir, but can never find the perfect licorice to match it? In these cases, I will try until I succeed. Whatever the costs. Posted in White Wine and tagged Candy, Chardonnay, Lindt & Sprüngli, Malbec, MattBites, Pinot Noir, Wine, wine pairing, wine review, wino. Bookmark the permalink.